Join the discussion on our forums! Come discuss Omega Devastator over in our dedicated Omega Devastator discussion topic. Battlecry: If you have 10 Mana Crystals, deal 10 damage to a minion. I don't know how anyone rates this card only as "Very Good". 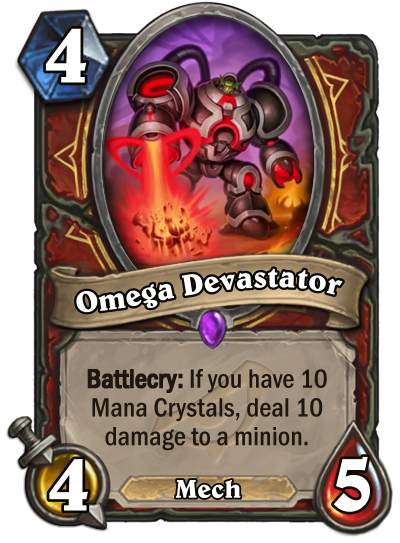 I can say this with 0% uncertainly - Omega Devastator is the most broken card in the expansion (It's not even remotely close). This card needs to be at least 6 mana, and if not, the Mech tag needs to be removed. All this tempo and value and potential 3-for-1's for just 4 mana, as well as being able to cast 2 devastators in a single turn, is just filthy and broken. It's synergies with Dr. Boom hero and Omega Assembly make it super frustrating to play against. This card is just stupidly overpowered.. 4 Mana 4/5 deal 10 damage is just totally stupid. Just cut the damage in half to 5 dmg and it would still be strong, but 10 dmg is just to broken srsly.. I legitimately think this is the best card of the expansion. Seriously, I think this card is amazing. Almost every Dragon deck runs Crowd Roaster, and that's completely inferior to this in every way. This is Chillwind Yeti on curve, the best vanilla statline. This card has the mech tag, so it synergises with Dr. Boom, Mad Genius and Magnetic. On turn 10 (something almost every Warrior deck makes it to), this is pretty much Assassinate with a body. I legitimately think that if your Warrior deck isn't Odd Warrior or Pirate Warrior, and you aren't running this card, then your deck is worse off. Run this card. Now, some might see this as fair since it needs an activator that seems reasonable, but I see warrior, which means you live past turn 10 if you want to, as well as a Yeti that has the mech tag and deals 10 damage to a minion of your choice, and while we can count out the rush from absolutely always being active, the Dr. Boom hero doesn't really have difficulty fitting in most to any non-aggro warrior decks, thus, we'd likely expect this to have rush on top of everything else. Now, I'm not debating over whether warrior needs this or not, or other such, but bloody hell does this make even things like Blaze Caller and Vilespine look powerless. Missed a chance to call it Omega Yeti.